Here are the top 8 Bible verses that mention the Antichrist. In the Apostle John’s own day, there were already anti-Christ’s around and they were those who denied that Jesus had come in the flesh and that He was also divine or God. Anyone who says that Jesus was only a good Man, a good teacher, or a prophet is missing out on the fact that Jesus is also God and anyone who doesn’t think Jesus is also God by confessing it publicly, is an anti-Christ or against Christ. The Apostle John, like many in the church and even the apostles, thought that Jesus was coming back in their lifetime and they also believed that they were living in “the last hour.” Why did John think this? It was because “many anti-Christ’s had already come” and so he thought it was the last hour or the time just before Jesus’ return. Again, by the time John was writing this, many deceivers were already going out into the world and once again, they are those who did not believe and confess to Jesus’ first coming and they also deny that He came in the flesh. Anyone who denies that Jesus didn’t come in the flesh (born of a virgin as a babe) and those who apparently deny His second coming is an anti-Christ. They will find out that they were wrong someday but it will be far too late by then to do anything about it. Is the lawless one “the” anti-Christ or one of many? It appears that this lawless one is empowered by Satan and gives him the ability to perform false signs and wonders and allow those who “refused to love the truth and so be saved” and be deceived. John doesn’t care what others think about his statement that whoever denies that Jesus is the Christ (the anointed one) or the Messiah is a liar and has no truth in him or her. 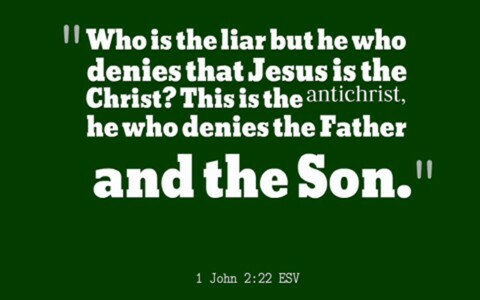 The anti-Christ is the one who denies Jesus coming as the Christ just as whoever does this also denies the Father Whom He sent and by doing so, they also deny the Son of God. Is this lawless one who is revealed the anti-Christ? I don’t know….but anyone who denies that Jesus is the Christ or anointed One of God is against (anti-) God and is a son or daughter of destruction. This man of lawlessness will desire to be worshiped, just like Satan did at one time, and this “man” will seek to not only be worshiped but will proclaim “himself to be God” and take his seat in the temple and desire worship, which is outrageous for he is the opposite of God. I don’t know all the details of exactly what will happen. Studying prophecy can easily take our eyes off of Jesus and away from the biblical gospel message of repentance and faith. Some people are so fixated on prophecy that they seem to almost make it an idol and worship it instead of the Creator Who alone is worthy of praise, glory, and worship. I don`t know where I read this from that the anti christ is going to be somebody who is going to be well liked. He will be very popular doing good works for other countries but with one big flaw you will have to join into his system. That means the mark of the beast and by excepting that mark you are doomed to hell. If you refuse the mark you will die anyway but you have put your faith in God you will go to heaven. It`s evan taken shape now in todays world it`s called the New World Order. I can evan give names to some of them Bush and Brown(English) The Monarchy who are a member`s of a elite club. Bush was evan caught out by a journalist when he asked him a question he gave the wrong answer then Bush went very quiet,and came out with the words that`s politics. Hope you are keeping well Jack. Next post: What Does The Bible Say About Arrogance?